for property at 214 54th St.
by city planner Bill Brisson. __ fishing from a residential dock. O | in reference to a dropped 911 call. nroll- hear screaming at the back of the house. j trying to help Ranieri. Police Chief Bill Tokajer said. i* water until more help arrived, Tokajer said. dock, according to the report. He was lifted onto a neighbor's kayak. Ranieri on the kayak from the water. the dock when the weather is nice. vices for her husband in Ontario. "He will be missed," she said. The city attorney was not present. cant notifying them of the hearing. cant was changing its proposal. continuance to amend the application. Yep. There's an app for that. walkers this year during sea turtle nesting season. new application and 10 new tablets to collect data. that paid for the apps development and 10 tablets. and work out any kinks. Fox, executive director of AMITW. bursed around May 1, according to Fox. to demonstrate the new app. which is the heaviest commercial land-use zoning. mercial property to the east and the south. mercial units on the ground level. application to the city by May 7.
request fits in the area," she said. the line is very abrupt." what the property has been used as," he said. sioner Jean Peelen came to a conclusion March 25.
erty. Please, leave our residents' areas alone." might as well make mine commercial, too." The public hearings were continued to 7 p.m.
the most weight, she said. regarding the application at the May 21 meeting. lesson by letting someone else pay for it," he said. only that she was being sued as an individual. officials acting within the scope of their duties. apologize for the mistake I made." April 16, at city hall. Bradenton Beach folks are making some noise. like that's the way this law is written. " be read is "still to be determined." and could be subject to legal interpretation. erty where the person making the complaint resides,"
Gilbert wrote in an email. the distance, weather conditions and other factors. but confusion since the ordinance was passed. Beach on Gulf Drive will soon get a face-lift. the weathered traffic island at their April 2 meeting. family as the sago palms already in the traffic island. serve to consider at their May 7 meeting. project going by mid-June, he added. a lookout tower, West said. public comment on the topic inside chambers. property line rather than from the source. final advertised public reading of the ordinance. decreases again to 55 decibels 2-7 a.m.
April 10, 6 p.m., city commission. April 24, 6 p.m., city commission. April 9, 10 a.m., CIP. April 9, 10:30 a.m., CRA. April 9, 3 p.m., planning and zoning. April 10, 1 p.m., department heads. April 10, 2:15 p.m., budget. April 16, 11 a.m., pier team. April 17, 1 p.m., city commission. April 9, 9 a.m., charter review. April 10, 7 p.m., city commission. April 15, 11 a.m., city center. April 23, 9 a.m., charter review. April 24, 11:30 a.m., police retirement board. April 24, 7 p.m., city commission. around businesses in the Bridge Street area. matter further at a future meeting. regarding a proposed noise ordinance. p.m. Saturday, with no services allowed Sundays. bor's patio or a window of the main living area. is allowed in the setbacks, or side yards, of homes. listed in the original ordinance. April 22, 9 a.m., county commission. April 17, 6 p.m., commission. April 24, 9 a.m., pension board. Elected Officials, Longboat Key Town Hall. ning Organization, Bradenton Beach City Hall. scarcely vary from the original ordinance. "What kinds of problems is this going to lead to? necessarily be required to enclose their space. make it a requirement?" said Peelen. as opposed to adding restrictions to the ordinance. for sites to be evaluated on a case-by-case basis. Drive including outdoor food vendors. setup of the associated indoor dining establishment. a free-standing bar, like a margarita hut," said Brisson. "The allowable uses needs to be updated. Honestly,"
is and it's "Hurry up and wait." it takes tolerance and, sometimes, fortitude. islanders, I think many of us often wonder that, too. Friday and Saturday, April 11-12. See you there! a big Gloria Dei yard sale. See you there? or your faith celebrates during the Easter season. So long Anna Maria Island for another year. So long servers at Two Scoops. So long to Geyer girls and others at Duffy's. love your cantor! We love your pancake breakfasts. as well as locals such as Tom, Al, Ruth and others. Bill and Rose Wolfe, Bennington, Vt.
house wine sold for an entire week. row at Manatee County Animal Services. been: Get your own bridge. It was first suggested many years ago. to regulate parking or increase parking turnover. Did I hear someone say, "I want the money?" New staff would likely be added. Hmmm. meters in front of them. Not a pretty site. box houses. This is a very bad idea. with what's happening on Anna Maria Island. everything you need if your "heart is on Anna Maria Island." Credit card: J B [ = No. would be available in about 12 months. "much too complicated" without a city manager. 11. Fukinsei Art Lab .- . members and one for officers. board just before ballots were submitted. were re-elected to their respective posts. Von Hahmann did not run again for her position. Mike Northfield won the seat with 78 votes. Shore won the seat of secretary with 79 votes. ful, which sponsors the countywide cleanup. the first three months of 2014. Festival brought in close to $100,000. Von Hahmann also talked about "big ticket items"
munity center the former firehouse. about improving the FISH Preserve. "It's been hurry up and wait this year," she said. the Southwest Florida Water Management District. m bely and Rose Lipke. supports the fishing industry," von Hahmann said. members at its weekly meetings. for running the Sea Scouts. and the traditions of Cortez. LIMITED EDITION JE\\ ELRV. TO ENJOV VIEN\ ING EXAMNIPLES OF MAN) OF OUR PIECES. -LIU B\If I i \\l)Jl.\ I R\. ( I ) "
the supervision of CP&E, Pierro said. regulate the flow of sand along the coast," he said. mission would make the decision along with county the state's share will be in the 2014-15 state budget. "But if it works on Longboat Key, I hope it might governor, usually in June, Hunsicker said. Hunsicker said his department is still research- construction. and 224 traffic citations in the city in March. topped the list with 12 and 16 respectively. of which were deemed violations. from 35 tickets in March. tions for officers and dispatchers. and seven tickets for miscellaneous offenses. Attend Our "Knowledge Is Power" Educational Series. to "Key Largo" and revisit the video on YouTube. our island and community center," she said. merce will be 5-10 p.m. The Saturday hours will be 10 a.m.-10 p.m.
the year and our largest fundraiser," Stiles said. some environment for kids, teenagers and adults." ing through the family foundations program. atee Community Foundation provided the grant. For more info, call the center at 941-778-1908.
for the public will be 6-8 p.m. Friday, April 11.
pieces from Cuba to the Anna Maria gallery. 11, in downtown Holmes Beach. Restless Natives, 5314 Marina Drive. Artists' Guild Gallery, 5414 Marina Drive. Beach Life AMI, 5337 Gulf Drive. ret Kelley -especially her wildlife images. In Florida, she's focused on waterbirds. Island Gallery West, 5368 Gulf Drive. Libby's Island Jewelry, 5337 Gulf Drive. Arts for the Earth, 5345 Gulf Drive. Fukinsei Art Lab, 5437 Gulf Drive. Island Tattoo, 5306 Holmes Blvd. 5:30-7:30 p.m. Friday, April 11.
gallerywest.com or call IGW at 941-778-6648. The reception will take place 5:30-7:30 p.m.
programs in drawing and ceramics. Tiffany Yoon and Zhuo Zhao. .^ ,) 7 All in-stock Citizen watches. 8 8102 CORTEZ RD. W.
*j :.. : ,; .:. 1 gulf drive holmes beach Bl[j. 7:53 p.m. Official sunset time. various venues, Gulf and Marina drives, Holmes Beach. Drive, Holmes Beach. Information: 941-778-6694. 5:30-7:30 p.m. -Anna Maria Island Art League St.
7:54 p.m. Official sunset time. Thieves Market, Coquina Beach, Bradenton Beach. Dei Lutheran Church, 6608 Marina Drive, Holmes Beach. 7:55 p.m. Official sunset time. 7:56 p.m. Official sunset time. Salty celebration, 4415 119th St. W., Cortez. Fee applies. Show, McKechnie Field, 1611 Ninth St. W., Bradenton. April 19, Sandbar Restaurant egg hunt, Anna Maria. April 25, National Arbor Day. April 28, Holocaust Remembrance Day. May 3, Food and Wine on Pine, Anna Maria. May 17-18, Relay for Life of AMI, Coquina Beach. June 7, Island Blood Drive, TBA. IE CMYlyIitt 7 tmlM-1. u P[t 4 w i[lrtth l ,. Coquina Beach early Saturday, April 12, to set up the . final Thieves Market of the season. the beach in south Bradenton Beach.',. hot dogs and barbecue near the Privateers' ship. .. Hours will be 8 a.m.-3 p.m. "
For more information, including vendor details, . front, downtown Bradenton. Information: 941-840-0013. Riverwalk, downtown Bradenton. Information: 941-840-0013. 201 10th St. W., Bradenton. Information: 941-746-4131. Library, 5701 Marina Drive. Information: 941-778-6341. Marina Drive, Holmes Beach. Information: 941-778-3209. Drive, Holmes Beach. Information: 312-315-6212. Drive, Holmes Beach. Information: 941-778-1383. Farmers' Market, Old Main Street. Information: 941-932-9440. St. W., Bradenton. Information: 941-746-4131. Museum, 4415 119th St. W., Cortez. Information: 941-708-6120. Island Library, 5701 Marina Drive. Information: 941-778-6341. 107 Bridge St., Bradenton Beach. Information: 215-906-0668. For more information, call 941- 778- 1813. Friday, April 25, and Saturday, April 26.
meeting, 5801 33rd Ave. Court Drive W., G.T. Bray Park, Bradenton. Marina Drive, Holmes Beach. Information: 941-778-6341.
copal Church of the Annunciation, 4408 Gulf Drive, Holmes Beach. Mexico Drive, Longboat Key. Information: 941-387-0202. * Unique clothing & gifts for men, women & children. and everything for the beach. move toCotex frm the anateeBear..
will be in operation at 6 a.m.
Church will deliver the invocation. Thomas will provide the music. Palm Sunday service will be at 9 a.m.
A Good Friday service will be at 7 p.m.
Easter service will be at 9 a.m.
Eucharists at 8 a.m. and 10:30 a.m.
service, the Vigil in the Garden will begin. of the parish, both clergy and lay. Eucharist Rite II with music at 9 a.m.
story and an Easter egg hunt about 10:15 a.m.
II with music at 11 a.m.
be a service at 5 p.m. Saturday, April 12, and 9:30 a.m.
stripping of the altar at 7 p.m.
(Service of Darkness) on Good Friday. at 8 a.m. and 10:30 a.m.
brunch and hold an Easter egg hunt. choir and children in a palm processional. and special music by flautist Mary Deur. On Easter Sunday, there will be 9 a.m. and 11 a.m.
a flower to place on the cross. Will Care For Your Home? to your home while you're away for the summer. It could cost you thousands of dollars! care for their Island homes for more than 20 years. "Your Eyes Here While You're Away"
ExperienceJupiter, the finest handcrafted boat. IC A N N O N S \ After all, you deserve nothing less. M ARINA Contact us today. end bus from Coquina Beach in Bradenton Beach. will begin at 6:30 a.m.
services to minimize noise from idling engines. "When everyone else is closed"
Family Owned and Operated Since 1975 OPEN SAT. Reservations were required by April 8.
a.m. and the Easter Bunny will greet children. bar Restaurant and Anna Maria Donuts. An Easter bonnet contest for kids and adults. or a chocolate Easter bunny. Dara Caudill of Island Photography. For more, call Tina Fusaro at 941-778-8710. ICE CREAM MADE ON SITE. ent from ki\ ikin,_'. crew and canoeing." team. How wonderful is that?" An Islander Q&A with Melinda Bradway. to compete in dragon boat racing? HOLISTIC HEALTH CARE IN A BEAUTIFUL SPA ENVIRONMENT! 20 to participate in the race. what are the skills or attributes to doing well? fastest-growing water sport in the world? on the island. Can you talk more about that? SI H I i : I III 111- 1, II I . 2 or More Molars Only! 30 years experience in the Bradenton Area. Emergencies and Walk-ins Always Welcome! on the Manatee River in late March. away from their video games. Anna Maria Island to join our program. The Islander: What does the pilot program cost? trial. We will start our annual program in September. paradise, what should they do next? is starting now. We already have 40 interested people. So, the sooner people sign up, the better. I- lS i -'S. . . . .
April 12, for the Great American Cleanup. of the bridge by Crab Trap I. Road 70 and Linger Lodge Road. program will be cleaning their areas that morning. with pennies instead of ballots. second and third in various categories. Vilord, second; Jean Taylor, third. second; Anne Ricci and Georgia Simon, third. Sawe, second; Cynthia Foster, third. Marilyn Shirley, second; Priscilla Seewald, third. Arts Center, 502 Third Ave. W., Bradenton, at 2 p.m.
at the ticket office at 941-748-5875.
n and Healing 9:45 a.m.
1i 17, at 5 p.m.
Special Choir Cantata Service: "You Are the Christ"
SERMON: "The First Easter Message"
mance by students at the Manatee School of the Arts. with A.P. Bell Fish Co. providing the fried mackerel. People are invited to bring a dish to share. sweet and salty celebration Saturday, April 12.
games, a photo booth and musical entertainment. Tickets are $25 for adults, $15 for children. Maria Island might want to avoid the race area. and propelled using only paddles. The race will end about 2 p.m.
26, and the grand parade, Saturday, April 26.
while placing her in custody. fight in the 100 block of Bridge Street. icated, acted aggressively toward Gill. erratically and yelled obscenities, the report said. bicep, according to the report. At some point, Gill's hand was broken. window of the patrol car. She was treated by EMS for a facial laceration. Blake Medical Center in Bradenton. ebrating because she got a new job. Island police blotter two relatives. sale was falsely listed as "for rent" on Craigslist. refused sobriety tests but was allegedly intoxicated. issued a traffic citation for reckless driving. vodka bottle and plastic cups. pink flamingo and smashed a porcelain mushroom. March 16, 200 block of 35th Street, bike theft. the bike down the street. "Best food, best service, best view... Any closer to the water, your feet will get wet!" on a bed of rocks during a fight April 1.
during the altercation, the report said. Beach and jumping into the water. j answering a court summons. standing warrant for her arrest. water after her, the report said. However, Tsakiri was unable to locate Thurman. tee County jail on a $5,000 bond. His arraignment hearing will be held at 9 a.m.
Center, 1051 Manatee Ave. W., Bradenton. deputies stopped her for not using the sidewalk. small glass pipe, according to the report. She was convicted March 28, 2013.
custody at the Manatee County jail on a $30,000 bond. nity Center, P.O. Box 253, Anna Maria FL 34216. She attended the University of Michigan. On Dec.
Ave. W., Bradenton FL 34205. Round up the young 'uns. For more information, call at 941-708-5525. * desserts. And free WiFi. * Mention this ad for 15% OFF! *9:15 a.m. Tuesday, April 15, fire drill. Tuesday, April 18, no school. 5-6 p.m. Monday, April 24, PTO dinner, AME cafeteria. ents' end of the year picnic, Anna Maria Island Beach Cafe. 8:45 a.m. Tuesday, April 29, speech contest. 5-6 p.m. Tuesday, April 29, PTO dinner, AME cafeteria. Breakfast: Eggs and Cheese or Sausage and Cheese Bagel. Breakfast: Sausage Patty on a Biscuit. Carrots, Fresh Fruit Cup and Birthday Ice Cream Cup. Soup, Baked Vegetarian Beans and Mixed Fruit Cocktail. Breakfast: Egg and Cheese Breakfast Burrito. with Dip and Strawberry Cup. was good for an extra point. 73 yards in the loss. among the league's three teams. first in the regular season. claim the trophy and, of course, bl_''ili,- rights. for second with matching scores of 6-under -par 26.
terson with matching 8- under-par 24s. der-par 18 to obliterate the field in Flight C.
advance to the championship game. Lothschutz and Rod Bussey by a 23-19 score. normal, levels and the fish are reacting. on a fluorocarbon leader is putting fish in the cooler. mullet are a good bet, especially for trout. bait live shrimp, shiners and pinfish. drum 15-25 inches with a lot of fish in the upper range. although most are under the 12-inch minimum size. up a sporadic mack. Mixed in are ladyfish and jacks. to catch one of these tasty flat fish. Live Target lipped plug in a Spanish mackerel pattern. some large Spanish mackerel and barracuda. April 1 1 1:1J . Greg McMullan, 11, joined the photo op. Finally, the inshore bite is steadily improving. ing, as well as for snook and redfish. shiners over sandy potholes and shallow grass flats. variety of species are being found. the bottom, resulting in limits of mangrove snapper. mangoes are hogfish always a welcome sight. sota Bay with good results on backwater species. fish from all three species are coming to the boat. only 3 feet of water. on a charter with Capt. Warren Girle. Are you ready for spring fishing? 778-1541 or go online to amiweddingfestival.com. Relish Cafe, 505 Pine Ave., Anna Maria. seating at the cafe is limited, the release said. For more information, call 941-896-8890. 4:30-6:30 p.m. Wednesday, April 23.
includes a variety of wines and hors d'oeuvre. 65th Street on a conforming duplex lot. rental history and potential. $519,000. 7:45 a.m., at the request of members. Breakfast is $8 and reservations are required. agent award for the month. 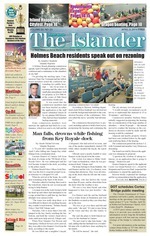 ered, email your "who, what, where, when and why"
to news@islander.org. Hi-res photos welcome. V Our newest agent has been with us 16 years. V 36 years managing rentals on Anna Maria. V All Florida licensed real estate agents. V No hidden fees: You keep more of your money. V Compare our management fees. 03/14/14, Krosney to Scatigno for $500,000;list $525,000. Karp to Hunter for $479,000; list $499,000. Baltussen for $460,000; list $469,000. in 1979 was sold 03/21/14, May to Childress for $450,000. 03/18/14, Twait to Lynch for $450,000. Mutzer to Kohrs for $425,000; list $449,900. Moerk toAlamanda by the Gulf LLC for $420,000; list $430,000. Miranda to Tropical Island Homes LLP for $383,500. Valentine to Calme for $330,000. Maldonado to Padgett for $275,000. to Thrasher for $240,000; list $269,000. to Patient for $235,000; list $245,000. Maria, can be reached at 941-778-7244.
istry of Presence for kids and teens in Haiti. office, 5604B Marina Drive, Holmes Beach. ers, chests, kitchen. Sale by Julie McClure. 2p.m. Tuesday and Thursday, 10 a.m.-1 p.m.
Pine Ave. Anna Maria. 941-779-2733. Turn the page for more island garage sales! KlNG n -Bed: A bargain! ......... 1' i-,, .. I1,n i 0O new/used. 0( old bull terrier mi\. Carmen and oilither rescued, adopltdble pets. MY FIRST GARAGE sale: 8:30 a.m.-2 p.m.
Holmes Beach. No early birds, please. YARD SALE: 9 a.m.-2 p.m. Saturday April 12. MULTI-FAMILY YARD sale: 9 a.m.-1 p.m.
orations. 505 69th St., Holmes Beach. weekends and evenings. Retirees welcome. wireless networking, custom system design. the airport or anywhere in Florida. Flat rates. U FLY I drive your car anywhere in the USA. ings, houses driveways etc. 941-251-5948. Hive, 119 Bridge St., Bradenton Beach. tial, business, rental properties. For "divine"
results, call John and Nan, 248-802-7802.
ness. Email Lisa Neff at lmneff@me.com. Beach. I make dirty windows sparkling clean. installations, watering the island for 15 years. hauling, cleanup. Island resident 25 years. in old Florida seashell driveways and scrapes. SHELL DELIVERED AND spread. $50/yard. commercial. For all your landscaping needs. per. Island references. Bill, 941-795-5100.
of carpentry, repairs and painting. Insured. stuck, loose, leaks, needs paint, etc. I'll fix it. area. The Flying Dutchman, 941-447-6747. Peter for free estimate, references, insured. Michigan builder, quality work guaranteed. 3BR/2BA. Holmes Beach. Monthly, $3,500. El Conquistador Parkway. 4816 61st. Ave.
Pinellas: (727) 424-0220 Manatee: (941) 928-9112. Lawn care PLUS native plants. e. '"
Let us put our 35 years of experience to work for y0ou! appliances, updated bathrooms and a one-car garage. change. Direct beach views. $499,000. BEACHFRONT CONDO 2BR/2BA direct beachfront. to Bimini Bay and open water. $699,000. porch, open sun deck, large carport. $2,300,000. OPEN HOUSE: 1-3 p.m. Sunday, Feb. 9.
tion. Great investment. 309A 65th St. www. Intracoastal, one block to beach. $475,000. kitchen, mint condition, private backyard. Gulf property with pool, clubhouse, turnkey. stainless-steel kitchen and magnificent bath. ances, etc. An island treasure. $849,500. .....-. .--.. .... -- --- . three pri, ate beaches or in your resort suite. you'll come back to %,isit us again && again. -" ', .. . .. .
s*iirels tire umnuizing. I c.rr romntiic. Tie Iworl, l.this iv the phice to 1go. " "Best Food on the Gult Coast"